Is this Medieval group an important piece to the puzzle? Criminals have a dilemma. If they remain silent, we may expose and arrest them, but if they try to deceive us by mixing deception with truth, they risk exposing more information about themselves because we may identify the truth and ignore the deception. One of the suspicious "truth seekers", Rayelan Allan, who runs Rumor Mill News, was recently interviewed on radio. Her attempt to deceive us may provide us with some important clues as to what is going on. She describes Faction 1 as the New World Order, which she further clarifies as being the Rothschilds, bankers, corporations, and monarchies of Europe. She describes these as bad people who want to take control of the world and turn us into their slaves. Faction Two is descended from the King of Bavaria, the Knights Templars and the German Abwehr. Faction Two was created by men whose countries had been destroyed by the New World Order. If you watched Part 3 of my Masquerade Party videos, then you know that I also believe there are two primary groups fighting for control of the world. I agree with Rayelan Allan that one group is the Rothschilds, the bankers, and the economic and political monarchies. However, I think the second group, which she describes as a secret group of patriots, is actually the Zionist Jews. So why does she tell us that the second group is connected with the Knights Templar? Before I discus the Knights Templar, here is some information about her radio interview. On 28 September 2007, Gary Franchi interviewed Rayelan Allan for his Lone Lantern radio show. His show is on We The People Radio Network, which is almost identical to the GCN and RBN radio networks. They all produce Zionist propaganda, so we should assume that everybody who is promoted by those networks is mixing truth with deception. You can visualize their propaganda as bait on a hook. They have some truth to attract you, but it's mixed with deception, so try to find the truth and avoid the hook. Rayelan Allan claims that Faction 2 - the good people - come from the Knights Templar. While this could be deception, it could also be important information to explain what has been going on during these past few centuries. Let's try to pick the truth out of her message. 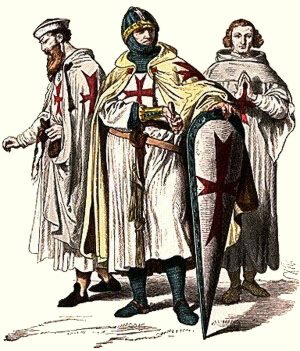 The original Knights Templar organization was created around 1100 AD. It was initially a group of only nine religious men. They were that era's version of security guards who offered some protection and assistance to religious people who were traveling to Palestine. Their simple headquarters was inside a mosque in Jerusalem. They depended on handouts for survival. The organization grew during the following decades, and they got involved in banking and usury, which brought them a lot of wealth. By 1300 they had tens of thousands of members in Europe, but their involvement with usury (and, some historians claim, their odd religious beliefs) started to cause anger and suspicion. By 1314 some of the members had been killed, and the others abandoned the organization. However, many of the members started similar organizations, and today we can find organizations in different nations that refer to themselves as the "Knights Templar". The Knights Templar didn't mean anything to me until Rayelan Allan's interview caused me to wonder about them. Why would she want us to believe that they are our heroes who are stuggling to save us from the Rothschilds and the monarchies? In the six years that I have been trying to expose 9/11, I never even noticed the existence of the Knights Templar. They never contacted me, and I never noticed them as a source of information. If it hadn't been for Allan's radio interview, I would still be ignoring them. She claims that the Knights are working secretly, but are they really afraid of a few banking families and monarchies? The Knights have divisions in America and Europe, so if such a large group of men is truly as as cowardly as she implies, we are fools to expect them to save us. Furthermore, the banking families and monarchies are thriving, so if the Knights are trying to stop them, they are failing. These Knights are a bunch of losers. Is she trying to fool us into looking to losers for help? Or, is there more to this situation? Why did the Knights Templar become involved in usury when only the Jews supposedly approved of the concept at that time? Were the Knights Templar really a group of Christians? Or had Jews infiltrated the organization? Rule number 11 states that the Knights are "To live without money". Why would the members be told to live without money when their leaders are becoming rich from usury? Rules 38 and 39 further emphasize a life without money. We find this same attitude with Scientology and monarchies. Specifically, the members are treated as stupid animals who serve a very wealthy master. Rule 18 is "Protection of the land of Jerusalem." Who were they protecting Jerusalem from, and who were they protecting it for? After the organization was destroyed, where did all the money go that the Knights Templar made from their banking operations? They must have acquired a lot of knowledge about banking systems, also; where did all of that valuable information go? Did any of the members simply re-create the similar organizations and banks, but with different names? Have they been passing their money and banking knowledge from generation to generation? Did Mayer Rothschild get funding with money that originally came from the group of bankers within the Knights Templar? Was he provided with an education in banking from the people who had been passing this knowledge on from one generation to the next? The Knights Templar got started because of the first Crusade. If the Knights were infiltrated by Jews, then we should consider that the Crusades were also instigated by Jews, and that the Catholic Church was infiltrated and manipulated by Jews. However, if the Jews were truly infiltrating the Catholic Church, instigating wars, and abusing people with their banking system, then we should find that at least a few people were complaining about them. Certainly some people would be able to see what was going on. Not surprisingly, we can find complaint after complaint after complaint about them. Luther didn't write "On Muslims and their lies", or "On Hindus and their lies", or "On atheists and their lies". For centuries we can find a lot of anger directed mainly at Jews. The Jews explain this as being due to "anti-Semitism" that runs rampant in Goyim, but a more sensible explanation is that this anger develops when people realize that a group of Jews is committing a lot of crime and abuse. Why does Rayelan Allan promote the Knights Templar as the good group? In 1897 the Rothschilds helped fund an official Zionist movement. At that time the bankers and the Zionists may have been working together in harmony. However, as I mentioned in my Masquerade Party video, I think the bankers and the Zionists are now fighting with each other for control of the Goyim and the world. Allan's theory would make sense if she is working with the Zionists. She is trying to convince us that the Knights Templar, and similar Christain groups, are the good people, and that they are struggling to defend us from the evil bankers. If the Christains help the Knights get rid of the Rothschilds, the Rockefellers, and the monarchies of Europe, then the Zionists would be able to take control of their banking systems and businesses. The foolish Christians would assume that they have just ended corruption, but in reality they would have helped the Zionists take over the world. Most Christians have been fooled into thinking that Israel is their best friend, and that their duty as a Christian is to protect Jerusalem from the Muslims. Therefore, these foolish Christians are not likely to complain if the Israelis got more control over the banking system, media companies, governments, and corporations. It's a clever trick, but now that we have the Internet, we have the ability to expose it. However, we cannot beat them unless we find more people to help spread this information. As long as most people continue to promote Alex Jones, Webster Tarpley, Gary Franchi, Rudy Giuliani, Ron Paul, Al Gore, the Architects and Engineers for 9/11 Truth, John Hagee, Pat Robertson, and other Zionist agents, they are going to win. There are an amazing number of Zionist agents, so we're going to need a lot of people to help us. Consider a few of the people associated with Rayelan Allan. Rayelan Allan claims that she was clueless as to her husband's top-secret and illegal activities until 1992 when Tom Valentine decided to tell her about it in a phone call. How would Tom Valentine know secrets about Rayelan Allan's husband? And what prompted him to tell her those dangerous secrets in a phone call? This sounds like a plot for a lousy Hollywood movie. To make the situation more suspicious, Tom Valentine worked with the Spotlight newspaper, which later became the American Free Press, so perhaps he is another member of that deceptive group that includes Willis Carto, Mike Piper, and Mark Lane. Rayelan Allan says that her husband, Gunther Russbacher, met Rodney Stich while they both were in jail. She says that Russbacher eventually trusted Stich and told him about the secret deal that George Bush had made with the Iranian government to delay the release of the hostages until after the election. What did Rodney do with that information? Did he pass it on to Israel? Rodney Stich was in jail for contempt of court, which is a trivial crime, so we should consider the possibility that his time in jail was merely to create the illusion that he was an honest "whistleblower", and that his assignment was to fool Russbacher into trusting him. Honneger is deceptive in regards to the 9/11 attack, so how would Ben-Menashe know if Honneger was telling the truth about in the Iranian hostage situation? It is possible that both of them are lying, but it is also possible that Rodney Stich told people everything that Russbacher had said. Everybody Rayelan Allan associates with or promotes is extremely suspicious. Each of those people lead us to somebody else who is suspicious. All of them are protecting Israel, which is evidence that they are all working for the Zionist crime network. Therefore, when they tell us that the Knights Templar are the good people, we should wonder how that theory benefits Israel. The bankers, the Zionists, the Yakuza, and other organized crime gangs depend on secrecy, but the Internet allows us to expose them and their techniques. You can help defeat organized crime simply by passing around this information. Don't assume somebody else will to do it. One reason this crime network is thriving is because there are so few people who will help us expose it. There are not many of us who are interested. Most people would rather lounge for hours in front of a television, and large numbers of people are foolishly promoting Alex Jones, Al Gore, George Soros, and other Zionist agents. There is also tremendous secrecy in the truths movements. Who runs all of these 9/11 groups, for example? Or all of these antiwar groups? Or all of these humanitarian and peace groups? A few years ago, most of us believed that the "truth seekers" were honest people. Today a lot of us realize that most of the truth seekers, whistleblowers, ex-secret agents, and investigators are liars. If you help to spread this information, eventually only the hopelessly stupid people will believe their propaganda. Our ancestors never properly dealt with the Knights Templar, the Illuminati, or other secret groups. Those organizations were destroyed, and a few of the members were killed, but most of the the people within the groups simply formed the same organizations with different names. Sometimes our ancestors did not even destroy a crime network; sometimes they just forced a group of Jews to move to some other nation, which is equivalent to dumping your trash in your neighbor's yard. We are fools if we make the same mistakes again. We don't get rid of organized crime by forcing the criminals to start another gang with different leadership. 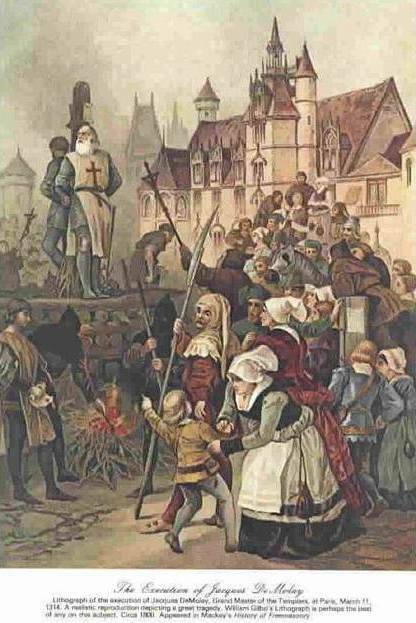 Some members of the Knights Templar were burned. This picture shows the burning of two men in France in 1314. Killing only a few gang members is like killing a few fleas; it does nothing. Furthermore, the people who were killed may not have been the criminals! It doesn't do any good to break up the Council on Foreign Relations, the Federal Reserve bank, the Zionist organizations, or the Yazuka. The criminals will just form new organizations. Is this concept really so difficult to understand? Breaking apart a criminal organization is as useless as making a corporation pay a fine when its leaders are caught committing crimes. It is the people who must be held accountable for their crimes, not their intangible organization. It is the criminals who try to convince you to punish the organization. Don't fall for their trick. Don't let criminals investigate their crimes! Most of the 9/11 "truth seekers" are trying to put all of the blame on a small number of people, such as George Bush, David Rockefeller, and Tony Blair. If the world falls for this trick, we will get rid of only a few people who the Zionists are willing to sacrifice. The Zionists will remain in control. This trick may have been used centuries ago. It is possible that criminals within the Knights Templar decided to sacrifice a few of their members in order to satisfy people's anger. Does death by fire have a religious meaning? Dictionaries describe a "holocaust" as death by fire. Therefore, some of the Knights Templar were killed in a holocaust. Who would promote such an inefficient and smelly method of execution? Nagasaki and Hiroshima were also subjected to a holocausts, as were other Japanese cities. However, the most famous holocaust was not a death by fire. Rather, according to the Zionist propaganda, the Nazis killed 6 million Jews with poison gas, hangings, and bullets. So, why do Jews refer to that lie as a "holocaust" rather than a "genocide"? Does death by burning have some religious significance to Jews?